The brown pelican is the only species of pelican that hunts its food by plunge diving. It soars high above the water and spots its prey from above. Once the brown pelican has located a suitable fish, its folds in its wings and plunges head-first into the water to catch the fish in its beak. Conservation Status: Although they are globally abundant, brown pelicans have, at times, been considered endangered in certain coastal areas of the United States. They are susceptible to problems from pesticide poisonings and being tangled up in fishing gear from commercial and recreational fishing. More recently, populations have been threatened by the Horizon oil spill in the Gulf of Mexico. The large pouch on the underside of the brown pelican’s beak can hold up to three gallons of water. 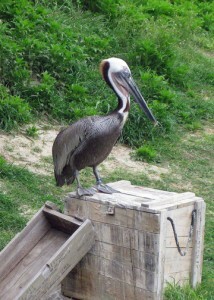 The brown pelican will drain off the water through the pouch and then swallow its fish whole.